On January 14, 2013, on the one-month anniversary of the Newtown CT tragedy, members of The Emmaus Ministry for Grieving Parents physically and spiritually joined the Friars of Holy Name Province in celebration of a Month’s Mind Memorial Mass at the Church of St. Francis of Assisi on 31rst Street in New York City for the victims of this horrific catastrophe. In an absolutely beautiful celebration, Fr. David Convertino, OFM, commemorated the victims and invoked the Holy Spirit at the Mass. 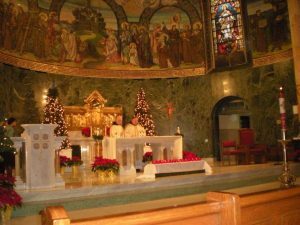 His homily (attached) addressed the question of “Where was God in All of This?” and “What does Jarius Have to Do with Newtown, CT?” Twenty-seven red commemorative candles in front of the altar remained lit during the Mass. In solidarity, all grieving parents of The Ministry for Grieving Parents, both individually and in their local parishes—as well as hundreds of friars, worshippers, and supporters in Massachusetts and other locations of Holy Name Province, from Maine to Florida, joined in this Memorial Remembrance on January 14, 2013—in the hopes of bringing some semblance of peace to those who are in need of so much healing. The Ministry of Grieving Parents hopes to continue to provide ongoing spiritual comfort to these grieving parents in the future when appropriate.